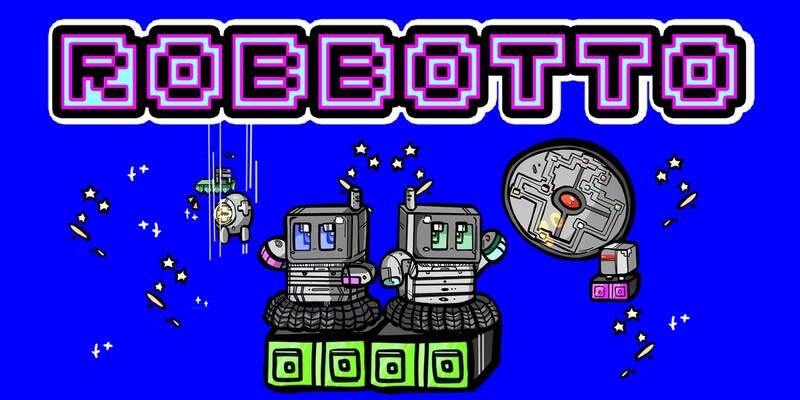 Robbotto is a cute arcade-like game that stars Robb and Otto, two of the last functioning robots on a space cruiser. This game is a fun challenge by yourself, but it shines when playing with a friend. This game is certainly challenging and has some simple puzzles that may be tough to get through, which is what makes it a great multiplayer. The gameplay of Robbotto is simple enough. You move around each level, avoiding the malfunctioning robots while trying to shut them down. Shutting down the other robots involves making them slow and spark with electricity before spraying them with water to short-circuit them. You can do this alone by pressing one button for electricity and the other for the water or you can play co-op in two different ways. Co-op mode allows you both to defeat the robots and true co-op mode means you really have to work together – one only has electricity and the other only has the water. That was a great challenge and one we’ll revisit, but the normal co-op mode was the best, in my opinion. Rather, the normal co-op mode was the mode we were best at, haha! The enemies have some intelligence. Rather than just mindlessly wandering a programmed line, they actively tried to come after us, jumping over obstacles on their way. There were a few times in true co-op mode where Rachel was being chased and I was trying to chase the malfunctioning robot in order to spark it before it caught Rachel. Some of them, as you get to later levels, spit at you as well. They’re not completely defenseless. There are also bosses that are pretty tricky as well. They’re easy enough, but we got stuck on the first boss mostly because there were lasers shooting at us from the corners and there was a lot on screen at once… even though it wasn’t even that bad. Playing either of the co-op modes makes the pair of you share lives. The hit boxes are fairly sensitive, enough so there were times when we wanted to argue about whether or not a malfunctioning robot touched us. Yet, the only consequence of losing all of the lives was your score starting over. You are able to jump right back into the level you were just playing instead of starting over from a certain point (such as, every five levels or so). Overall, the gameplay wasn’t too bad to get used to, and we had a ton of laughs trying to coordinate with one another in order to advance to the next level. In true arcade style, Robbotto’s graphics are in a pixel style. They’re clean and crisp, with bright eye colors to help distinguish Robb and Otto from the malfunctioning robots of each level. The levels are very simple in design but they certainly work. The backgrounds are vivid colors and have platforms to jump to and from in order to reach all the malfunctioning robots. Some are easier than others, but the simplicity of the level design worked well with this game. The music and sound effects were very satisfying. The game has an original soundtrack to go with it, and the pixel tunes were quite catchy. It reminded me of some of the Legend of Zelda games for the Game Boy Color, such as the Oracle duo, but probably a bit more upbeat. I would love to get this soundtrack. I often found myself bopping my head to the music, especially in between the levels. The sound effects were well done as well. Despite destroying robots, this had a good-feel to it. Robb and Otto are two maintenance robots working their way through their malfunctioning star cruiser. Together they attempt to shut down all the robots and machines that are wandering the ship in a rampage. It’s a very simple premise considering the game is more focused on the gameplay aspects, especially true co-op mode. Robb and Otto are adorable little robots just doing their best to help save their ship. Robbotto has 100 different levels with 10 bosses to defeat, either alone or with a friend. With its two different co-op modes, Robbotto has plenty of challenges up its sleeve and great fun to play and pick up again and again. Overall, Robbotto is a crisp game that’s easy to pick up whenever and where ever you want. It’s always fun to have a friend with you but it’s challenging enough with just yourself. It’s certainly a game to go back to again and again. Like this review? Check out more Nintendo reviews at Double Jump! Thanks for reading. This post was written by Kris P.